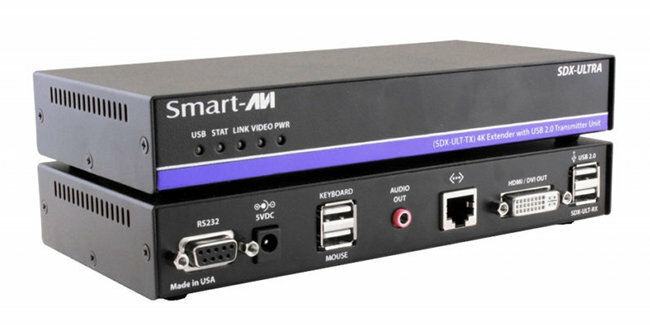 SDX-Ultra is a 4K ultra-HD video, USB 2.0, stereo audio, RS-232, and keyboard-mouse signal extender enhanced with the HDBaseT technology, sending signals up to 330 feet (100m) away using CAT5/6 cables. SDX-Ultra is the first extender on the market to feature 4K, USB, and full KVM extension on one cohesive system. Its DVI and HDMI-adaptable 4K (3840x2160 @ 60Hz) video output is optimized for HD monitors with crystal-clear picture excellent for detaildriven work. SDX-Ultra extends keyboard-mouse signals for remote workflow management and offers uninterrupted emulation from the user’s transmitter unit. This uninterrupted emulation prevents accidental disconnection or deactivation issues during mission critical operation. SDX-Ultra’s unparalleled KVM emulation makes it the perfect solution for server extension in applications ranging from data processing to interactive conferencing. 4K SDX-Ultra Extender with USB 2.0 and HDBaseT.